From La Sicilia today, aerial view of road and buildings near Sigonella. No students are coming to school tomorrow, and maybe none on Friday either. Happy early Christmas vacation. Unfortunately, the military housing areas have been flooded (there's a reason no Sicilian towns exist on that plain). I can't believe they put the housing in that location. 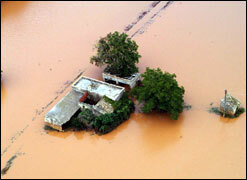 the simeto has flooded that area since the base was started in 1959. I am six months late here (just saw the site for the first time) but have they gotten the families back in? and built a Levee aroung it and the North and East sides of NAS II?